Let me preface this entire post with... "if you're expecting something awesome or new, prepare to be disappointed." I didn't set out to look for this place... actually, I wasn't even trying to find a place to eat actually. I was supposed to be running an errand or something for my grandmother, but I'm easily distracted by lots of things that other people would consider pretty dumb. When I saw a sign that said there was some sort of dish called 乾麵 (gan mian), which loosely translates to 'dry noodles,' for 15 NT (that's less than 50 cents! 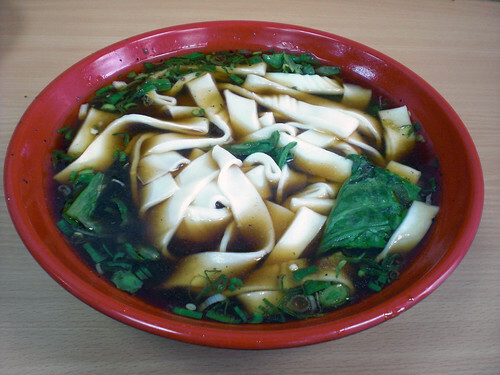 ), the allure of endless bowls of cheap noodles called to me. I scoped out the place to make sure that there were enough people inside, and surely it was packed, then I walked in to order (I've always been told if enough Chinese people collect in 1 place, then there's probably something worth waiting for). Anyway, onto the food! I felt really silly (and cheap) for ordering a bunch of orders of dry noodles, so I also added a 牛肉湯麵 or basically an order of beef noodle soup without beef. This shop is apparently somewhat famous for their different varieties of noodles, so I asked for the 版條 (ban tiao), which is basically really wide and thin rice noodles. The large bowl, which is seriously big costs 60 NT (just a shade under $2), and is a value driven dish. The broth is nothing special, and kind of watered down. The noodles are made in house, but could easily be confused with the prepackaged variety. All in all, there's nothing incredible about it aside from the size of the bowl. Have I mentioned it's insanely huge? For the price though, I could see the appeal to college and HS kids. This place is located right next to a bunch of tutoring places after all. As for the dry noodles, that's the picture at the very top. 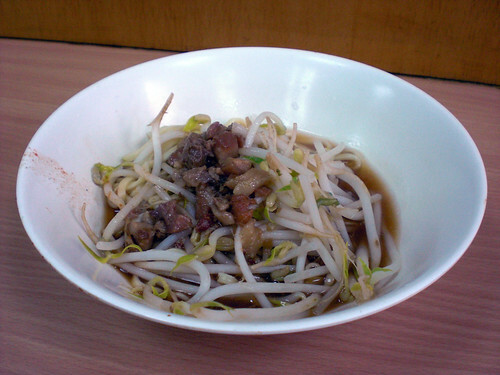 For 15 NT you get a small dish of 油麵 (you mian) mixed with a combination of 魯肉汁, otherwise known as minced pork sauce, bean sprouts, and a dash of what is most likely sesame oil. This was definitely better than the beef noodle soup dish, and if I could go back in time and redo my order, I would just get like... 4 orders of this. Again, nothing to write home about (wait... what's this post about then? ), but it's 50 cents! I don't think that'd get you a side order of bean sprouts in NYC. those pics look so good. where'd you find 'em? the restaurant or the pics? the noodle place is somewhere on 南陽街 near the taipei train station. if you meant the pics... they're mine :).